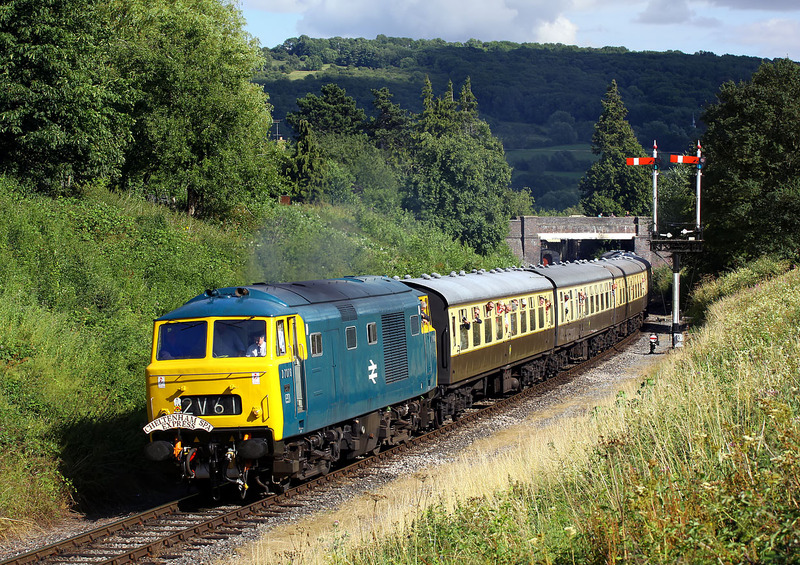 With a 'Cheltenham Spa Express' headboard, D7076 slowly accelerates away from Winchcombe station on 25 July 2015 with the 2C75 16:40 Toddington to Cheltenham Racecourse service, during the Gloucestershire Warwickshire Railway's Diesel Gala. Although thankfully spared the rain of the other two days, the large amount of cloud on this Saturday ruined a number of pictures, and came close to spoiling many others. How close this one came to being ruined can by judged by the cloud covered Salter's Hill in the background.